The Electric Hoist & Manual Ball Trolley Kit is rugged, portable, and provides quick, precise lifting. Two ton and three ton capacities are available. 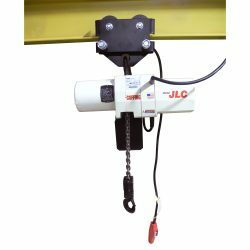 The kit includes the electric chain hoist with manual trolley, chain container, and a two button pendant.